For those in search of a thriving tree-dense community, architecturally-significant homes, winding residential streets, and a vibrant downtown, Summit is the place. It is THE local destination for boutique shopping and dining. Retail and commercial businesses offer specialty and gift shops, clothing stores, home furnishings, restaurants, wine outlets and ample parking all within walking distance. This gives Summit an urban, yet intimate feel that enhances the quality of life for everyone. Summit residents enjoy suburban benefits within a stone’s throw of NYC. A variety of architectural styles, quiet tree-lined streets, strong schools and great recreation make Summit a wonderful place to call home. 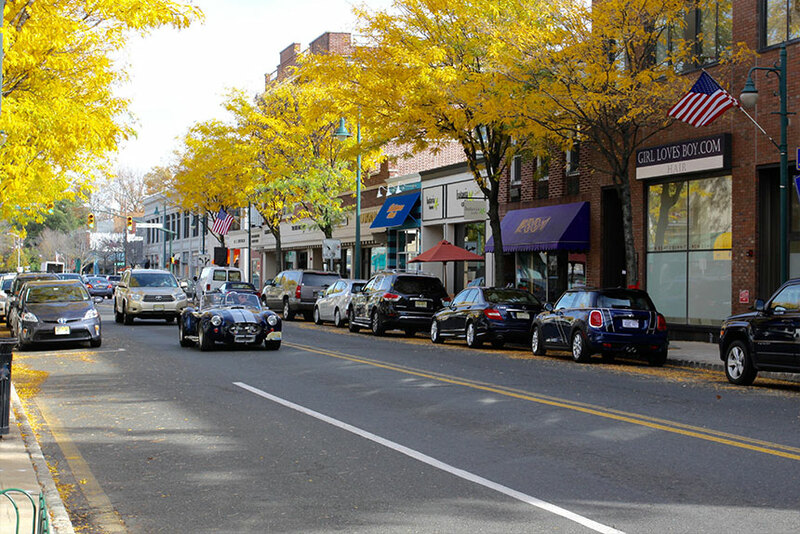 Summit NJ is located 25 miles due west of New York City, out the I-78 corridor. It is also just 15-20 minutes from Newark International Airport. The NJ Transit station in Summit is the hub for two incoming lines, allowing twice as many connections for a 40-minute ride to NYC. Click to see the map: Summit New Jersey. Education is a priority for Summit. The nationally-ranked Summit public school system includes Summit High School, a middle school for grades 6 to 8, five elementary schools and two primary schools for kindergarteners. There are three private schools in town and a number of parochial schools and preschools/daycare facilities in town or nearby. Summit High School consistently ranks among the top high schools in New Jersey. With a total enrollment of over 1,100 students, SHS offers 19 Advanced Placement Courses, 14 Honors level courses and numerous extracurricular and art related activities. 94% of the student body goes on to higher education at some of the finest colleges and universities in the country. Summit High School’s athletic teams are referred to as The Hilltoppers and its colors are maroon, white and gold. The school mascot is a mountain goat wearing a school jersey. Summit Middle School offers a well-rounded curriculum that includes math, reading, science and social studies, as well as language instruction in Latin, French, Spanish and Mandarin Chinese. These offerings, coupled with a top-notch sports program, ensure Summit Middle School students a rich and stimulating environment. Academic excellence, artistic expression and lifelong learning are the benchmarks of the Summit Elementary School system. Educators employ the latest teaching techniques and technology to provide a quality education to a stellar student body. The two Primary centers, Jefferson Primary and Wilson Primary provide Summit’s kindergarten students access to state-of-the-art early childhood education in warm, nurturing environments. Those who will enter kindergarten in the Brayton and Jefferson Districts attend Jefferson Primary. Those who will enter kindergarten in Franklin and Washington Districts will go to Wilson Primary. Kindergarten students in the Lincoln-Hubbard district are split between the two Primaries. If you are looking in the Lincoln-Hubbard district, check with me or call Town Hall about the districting. Two NJ Transit commuter rail lines converge in Summit, offering residents frequent train service to Penn Station or Hoboken. The Morristown Line (the Mid-town Direct) provides service to Penn Station 34th Street without any transfers; the commute time is approximately 38 minutes. The Gladstone Branch Line provides service to Hoboken with 2 direct trains into Penn Station. In Hoboken one can connect to either the PATH or Light Rail or use Ferry access via the Waterway in order to reach Wall Street. A Summit resident can easily obtain an annual residential parking-permit in order to commute via train or bus. The Lakeland Bus line offers Summit residents bus service from Summit to New York City Port Authority station. For those who wish to drive to work, Summit provides its residents with close proximity to I-78, Garden State Parkway and New Jersey Turnpike. Summit is just 20-minutes from Newark International Airport, which makes business or leisure travel a breeze. Here are the latest market stats for Summit NJ. Downtown Summit is THE area destination for boutique shopping and dining. Upscale retail stores share the commercial area with many family-owned businesses; this gives the town a sophisticated yet small-town ambiance. Shop Lululemon for yoga and athletic wear, Willow Street for stylish women’s clothing, Duxiana for high-end bedding, or sample the wares of various interior design or other clothing stores. Summit has something for everyone. My daughter urges me to mention her favorites: Scotti’s Record Shop, Color Me Mine, Wool & Grace Knitting Store and The Papery. The list goes on, so for a quick list of everything Summit check out the Summit Downtown website. Restaurants abound in Summit; for fine dining try Roots Steakhouse or La Focaccia. More casual options include Fin Raw Bar and Kitchen, Batavia Café, Tito’s Burritos or FOOD. Looking for family-friendly pizza or pasta? Try Randazzo, the Village Trattoria, or Marco Polo. From May through mid-November a weekly Summit Farmers Market sets up stalls on the corner of DeForest Avenue and Maple Street. There are so many shopping and dining options in Summit that you will always be able to try something new! Check out the Summit Directory for a list of all the great shops and restaurants in town. For the performing and visual arts lover, galleries, classes and performances abound. The five-screen Beacon Hill Cinema provides easy entertainment for all ages, and Summit is home to many arts groups, including the Visual Arts Center of NJ, The Summit Playhouse, The Stony Hill Players Theater and the Summit Public Art Initiative. Summit’s Recreation Department provides so many recreational facilities and programs that it is hard for enthusiastic residents to choose among the offerings. Numerous ball fields, tennis courts, playgrounds and parks are spread throughout the town. Check out the 25-acre Memorial Field, Tatlock Field with its synthetic fields and lighted tennis courts, Wilson Park with its newly rebuilt playground and two public platform tennis courts, or Bryant Park, a great spot for fitness training around a picturesque pond. On the Northside of town, the Reeves-Reed Arboretum gardens are a beautifully maintained example of early 20th-century landscape architecture. 12.5 acres of formal garden rooms, shrubs and flowering trees surround a historic Colonial Revival house dating from the late 19th century. The Arboretum (admission free) offers many educational programs and, in the summertime, there is a concert series on the grounds, another wonderful highlight of living in Summit. Other Summit recreational resources include an award-winning Summit outdoor aquatic center with two slides and a diving board, sand volleyball courts, basketball courts and a playground. The Summit YMCA and The Connection For Women and Families provide many classes and programs for both children and adults. The popular Summit Par 3 Golf Course is open to residents-only. Local private recreation options include The Beacon Hill Club, Canoe Brook Country Club, and Baltusrol Golf Club. Looking for a playground? Try Summit’s Mabie Playground near the train station, Memorial Field or Wilson Park. Wilson Park was destroyed during Hurricane Sandy, but it was rebuilt by the Wilson PTO and town residents. As with many of the surrounding towns, Summit passed from Indian to Colonial possession in the late 1600’s. Originally Summit was a cozy farming community, but, by the time of the Civil War, the town had changed from rural farming and milling into a quasi-commercial center. After the Civil War, the railroad came over “The Summit” hill and helped the town to become a summer resort area. Summit attracted city dwellers looking to build extensive summer estates. Gradually Summit became a major transportation hub, which transformed Summit into a booming commuter suburb for business people who worked in New York. Today, it is a family-oriented residential community with great schools, amenities and easy access to NYC.